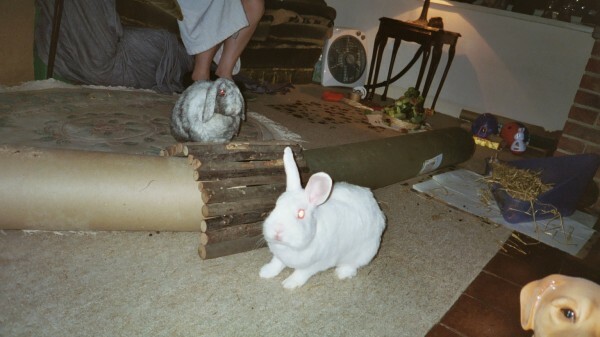 Well today my fellow lagamorphs, Yours truly & Flopsy Girl have been hiding under the table in the loung trying to get away from the AWFUL smell that the 2-foots are making. They opened a big tin of white stuff, and they have been brushing it all over the walls & ceiling in the porch, AND IT STINKS! I can only imagine that it must be to keep the fies away or something, I can't see what else it could be for. Flopsy Girl said that she thought that the 2-foots must want to change the colour in the porch, but I think that sounds stupid, but then again, Flopsy Girl does get some strange ideas. What's worse is though, as they have been spending all their time working in the porch, they have had no time for us whatsoever!